What Do You Know About Tomato Plant Diseases? Tomato plant diseases can ruin all of your hard work. You spent time and money buying tomato plants or seeds. You transplanted them into your garden. You watered them, fertilized them and supported them with a cage or stake. The blossoms have developed nicely and there's actually fruit on the vine that's starting to ripen. You can almost taste the fruits of your labor - literally. You walk out to your garden one day, only to find that there seems to be a problem - UGH! Blossom end rot is one of the most common tomato plant diseases. It appears as though the bottom of the fruit has turned black and is beginning to rot the inside of the tomato. It might look like there is black hole in the bottom of the fruit. This is caused because the tomato plant is not getting enough calcium. This could be caused from lack of water. If there is calcium in the soil, but no water, the plant has no way to absorb the calcium through the root system. If your garden has received adequate water, your soil may be calcium deficient. A good way to solve this problem is to work lime into the soil around your tomato plants. Lime can be purchased from your local garden center and is essentially limestone that has been crushed into a fine granular. After applying the lime, you should then soak the area thoroughly. Pick off any damaged fruit and discard it. It will take a few days for the plant to begin absorbing the calcium from the lime, but your problem will be solved and you should expect nicely formed fruit from now on. If the fruit has white or yellow patches, you may have a case of cloudy spot. This is caused by stink bugs that may have attacked the tomatoes when they were forming. Use a good insecticide that is labeled for killing stink bugs. Spray it according to the manufactures recommendations. Stink bugs are known to lurk in nearby weeds, so spend some time and pull those weeds in your garden. If the fruit has wide, deep cracks that appear to be emanating from the stem end, you're probably dealing with sour rot. Sour rot is caused by a fungus and usually occurs if the fruit has been lying on the ground. Make sure that your tomato plants are properly supported, either with cages or stakes, and make sure no fruit is touching the ground. Additionally, be sure that you are not watering the tops of the plants, as this can encourage fungal problems. Tomatoes can also develop cracks if they receive water on an irregular basis. The tomato plant may go through a dry spell due to lack of rain or inadequate watering. When lots of water becomes available, the plant absorbs too much too fast and the fruit begins to crack. Some varieties offer good disease resistance to tomato plant diseases. 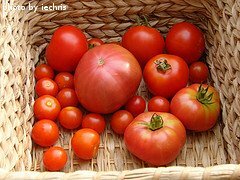 For regular tomatoes, try Sweet Seedless Hybrid, Celebrity, Rutgers, Pink Pounder and Mountain Magic Hybrid varieties. For paste tomatoes, try Roma, Viva Italia or Juliet. For unique heirloom varieties that offer good disease resistance, try Black Krim or Big Rainbow. For cherry or grape tomato varieties, Cherry Roma, Patio Sweetheart and Chadwick Cherry offer the best disease resistance. Keep in mind, these varieties offer disease resistance, they aren't disease-proof. If the tops of the plants stay wet for long periods, it would be rare NOT to get a fungal infection. We've had good results in our own garden with a homemade fungicide. We mix together 2 gallons water, 4 tablespoons baking soda and 4 tablespoon hydrogen peroxide in a 2 gallon pressure sprayer. We shake it up and spray all over our tomato plants every 10 days or so, or after every heavy rainfall. This mixture works quite well as a preventative measure, but if we still end up with a fungal infection, we switch to a commercial fungicide product. 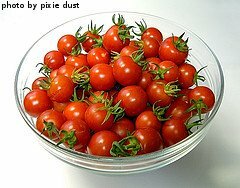 Most tomato plant diseases are caused by a lack of nutrients or by some sort of fungus. Proper fertilization and watering will prevent most of these diseases. If you do notice problems, usually indicated by black or brown spots or splotches on the leaves, or by white or gray powder on the leaves, you probably have a fungal infection. This should be treated immediately, either with a fungicide or an organic soap spray. Most fungicides are either copper-based or sulfur-based and both types are acceptable. Your local garden center should have a couple of different fungicides available, along with organic soap sprays.